Among the attractions of Fredericksburg, the queen of the Hill Country is the Museum of the Pacific War. Ever since I started visiting the Hill Country (shortly after coming to settle in a tiny suburban San Antonio home) in 1995, the Museum has been expanding by leaps and bounds. On my very first visit it seemed that everything was pretty much contained within the old Nimitz hotel, the steam-boat shaped edifice at the corner of Main and Washington, with the Japanese peace garden out around in back. At a slightly later date, there was a open-sided shed with sides of chain link, down across Town Creek which contained some large and small relatively indestructible exhibits ... but that was it. Until they began the Bush gallery, on an empty lot in back which faced Austin Street, and even that wasn't very much to look at ... at first. First it was completed, and then enlarged – maybe enlarged again. The garden alongside the old hotel was also renovated and landscaped, so that it looked more like it did at the end of the century before last – when the Nimitz Hotel was the social center/assembly room/auditorium/performance space for the area. There is a picture that I have seen in old histories of the area, of the garden as it was – with roses and hop vines growing up over cedar pergolas. Old Charles Henry Nimitz, Admiral Chester Nimitz's grandfather had built up the hotel from the four-roomed adobe house which existed on that particular town lot in the 1850s. He was quite a character, C.H. 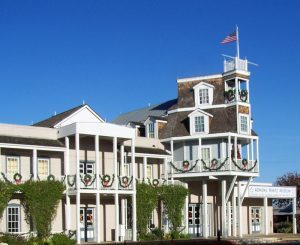 Nimitz – he had a reputation as a prankster and tall-tale-teller, but also was one of the most respected and successful town fathers; in the early days, the garden at the side of the hotel was a kind of beer garden. Now it is a garden again, but a little more ornate than before ... and the Bush gallery with all the indoor displays is huge. All the displays and relics which used to be in the old hotel building are there, and expanded upon. The Admiral Nimitz Foundation took over management of the hotel property in 2005, and has never looked back ... well, in the archival sense, they have looked back. As for the museum complex? It's now an excellent addition to Fredericksburg as a destination for sightseeing. The front of the Bush gallery – which seems to be about six times larger than it was on the first time I visited -- is adorned with what appears to be a submarine rising up from the depths. The Japanese mini-sub captured at Pearl Harbor, which used to be out in the garden, is now in its own exhibit space in the Bush gallery. Down the road a little way and across Town Creek, the out-of-doors Pacific War Zone is now three acres and change. 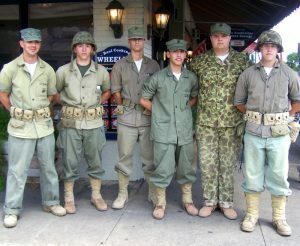 They have a whole PT boat there, and a vintage hospital operating theater set up in a Quonset hut, and an open-air beachhead exhibit, which is the venue for extensive reenactments throughout the year. The next one is scheduled for the weekend of June 30-July 1. If you miss it, there won't be another one until the first weekend in September. Which, considering the brutal summer heat of South Texas, is probably a good ideal. Still, I can't help thinking that the very best thing that you can do for your birthplace is to grow up and become very, very famous.